Behind the B-52’s longevity: overdesign to start with, and inventive, painstaking engineering ever since. It’s the world’s longest-serving, best-known, and most feared bomber. Built for the Cold War, the imposing swept-wing jet has adapted well to 21st-century global missions. It can fire cruise missiles, keep watch over vast stretches of ocean, and haul an array of conventional or nuclear weapons 8,800 miles without refueling. That the B-52 continues to make up half of America’s bomber fleet decades past its expected retirement date is a tribute to rigorous inspections and maintenance. But it’s also a triumph of engineering, starting with an overengineered original design that could accommodate myriad technological upgrades and airframe changes to suit any war. The storied Stratofortress might have stalled on the drawing board were it not for a handful of resourceful engineers who pulled off an 11th-hour rescue – almost literally from thin air. The day of reckoning arrived on Thursday, Oct. 21, 1948. Boeing’s engineering team was in Dayton, Ohio, presenting its latest design for the straight-wing, four-engine turboprop the Air Force had asked the company to develop. Conceived as a long-range nuclear bomber, the B-52 had hit turbulence almost from release of the first technical specifications in late 1945. Still, Boeing’s engineers were stunned when the project officer told them to scrub the propellers and produce an all-jet version. Joined by Boeing’s engineering chief, Ed Wells, and two colleagues fortuitously in Dayton on business, the team holed up in the Van Cleve Hotel and worked nonstop over a long weekend. They emerged with a 33-page proposal and an artfully crafted balsa-wood model of a swept-wing, eight-engine beast that could cover thousands of miles at high altitude. In April 1952, the B-52A made its first test flight. By 1962, Boeing had built 742 B-52s in eight iterations, series A to H. Amazingly, 76 of the B-52H’s – all built between 1961 and 1962, with an initial anticipated life span of 20 years – are still flying. Even more astonishing are the Air Force’s plans to continue operating its B-52s for an additional 40 years or so. That means the planes may reach 80 before finally being mothballed. Getting a new plane off the ground is challenging enough. But what does it take to keep old aircraft aloft and fit for missions as diverse as carrying 70,000 pounds of atomic bombs during the Cold War and providing close-air support in Afghanistan? Part of the B-52’s longevity lies in regular upgrades and enhanced technologies. The heavyweight bomber’s continued airworthiness stems from a rigorous schedule of inspections and maintenance – now more than ever – along with ingenious engineering to replace parts that are missing or no longer manufactured. “The engineering reality is, we can safely keep airplanes flying forever,” explains Charles Eastlake, an emeritus professor of aerospace engineering at Florida’s Embry-Riddle Aeronautical University. “If a part is damaged slightly, reinforce it; if it’s damaged badly, replace it. It all depends on how much time and money you’re willing to spend.” When it comes to the B-52s, the Air Force seems happy to splurge. In 2010, it awarded Boeing an eight-year, $11.9 billion contract to sustain and upgrade the fleet. That’s not counting the millions spent on routine upkeep. Still, compared with an estimated $55 billion the Air Force expects to pay for 100 long-range strike bombers, the BUFF, or Big Ugly Fat Fellow, seems a bargain. Given the Air Force’s track record of blowing through development budgets – the B-52 was the last bomber that didn’t run into cost-overrun headwinds – some critics contend that the final bill for the replacement bomber could be nearly four times that amount. (See sidebar, page 34.) Steep prices also limit purchases. Each 1980-vintage B-2 bomber, for example, cost $3 billion, which explains why only 20 were built. The B-52’s combat versatility and proven reliability also help keep it cruising. “It has the ability to deliver the largest assortment of weapons in the Air Force inventory,” Timothy Finch, a sustainment analyst with the Global Strike Command’s B-52 weapons system team, tells Prism. “It constantly maintains one of the highest mission-capable rates in the combat air force.” Those missions have morphed dramatically over the years. 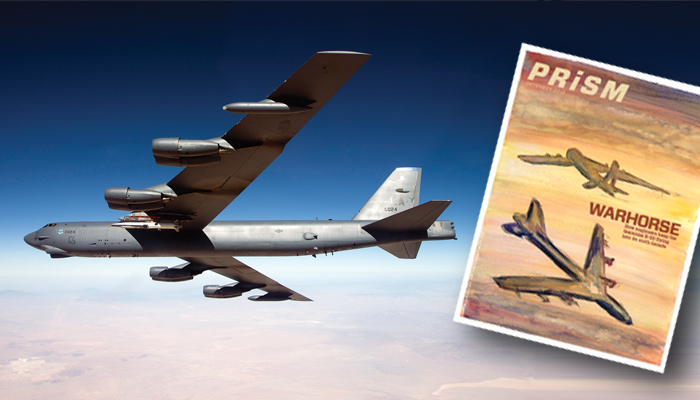 The early B-52s were high-flying nuclear Cold Warriors – today’s models can soar to 50,000 feet – that orbited just outside Soviet airspace during the 1962 Cuban missile crisis and starred in Dr. Strangelove. Reconfigured for combat in Vietnam as a low-altitude carpet bomber, the Stratofortress flew 100 sorties or more a day, scorching huge tracts of land with thousands of tons of conventional explosives. The B-52 pulled duty again in Desert Storm, swooping in at 300 feet to destroy Iraqi airfields in the first low-level attack in Strategic Air Command history. Today, it operates over Afghanistan. In a report earlier this year, the Congressional Research Service agreed that the bomber has unique strengths. It warned, however, that “if these capabilities remain static, mission effectiveness is likely to erode” against modern defenses. Hence the billions now devoted to upgrades. Recent improvements include a $76 million combat communications satellite system that will let B-52 crews send and receive real-time digital information to change a mission or redirect weapons. The B-52 also flies research missions. It served as the launch platform in May for the final test of the Air Force’s X-51A, an experimental craft developed to prove the viability of an autonomous, scramjet-powered hypersonic missile. The X-51A achieved speeds above Mach 5, setting new records. Improved avionics and other enhancements would serve little purpose if the B-52s literally were falling apart. Corrosion and fatigue cracks are the primary enemy of aging military aircraft, particularly in vintage airframes fashioned entirely from aluminum. “As the fleet ages,” Finch acknowledges, “corrosion control and prevention has become a challenge.” That’s why the Air Force recently revamped its inspection and corrosion-control efforts, he adds. Every four years, a B-52 makes its way to Tinker Air Force Base in Oklahoma for what’s called “depot maintenance,” or a nondestructive teardown, at a nearby Boeing facility. Parts that can be disassembled are taken apart and inspected, with repairs or replacements made as needed. “It’s stripped down, inspected, fixed, and put back together,” explains Scot Oathout, Boeing’s B-52 program director. That’s a big chore, given that the planes are nearly 160 feet long and have wingspans of 185 feet. Inspectors look for “material degradation of the structure,” says Gregory Shoales, director of the Center for Aircraft Structural Life Extension, the U.S. Air Force Academy’s largest research program for cadets and part of its mechanical engineering department. Corrosion and cracks are not two separate things but intrinsically linked, he says. “The majority of fatigue cracks start at a corrosion pit, and crack sites are places where corrosion can take root.” Besides visual inspections, engineers use a variety of technologies to assess how healthy a part is, including ultrasonics, X-rays, and surface eddy current; electromagnetic induction can detect below-surface corrosion in some materials. Meanwhile, the B-52s also undergo regular flight-line inspections and maintenance at their home bases. “The two inspections go hand in hand,” Oathout says. The crews keep precise flight records – data from sensors are used to check such things as stress levels and past areas of concern. For instance, if a hairline crack is found during depot maintenance, it may not initially be worrisome, but inspectors will keep track of it during flight-line checks to see if it begins to turn nasty. Although the Air Force has modeling software that can predict problems, Oathout says it’s not much use with the B-52s because stress corrosion in aluminum is unique and efforts to model it are not terribly accurate. So crews rely on inspections and records, and knowing where to look for trouble spots. Many parts of the plane – wing spars and terminal fittings, for instance – cannot be taken apart during depot maintenance and thus remain hidden from view. But engineers have a pretty good idea of when those items need replacing because of destructive teardowns they’ve done to decommissioned B-52s, which allow inspection of every single part. Replacing those hidden parts without dismantling the aircraft “is a particularly challenging engineering activity,” says Jim Kroening, Boeing’s B-52 Development Programs manager. Engineers have come up with procedures akin to laparoscopic or keyhole surgery to remove and replace parts without leaving any scar tissue. “From a structural standpoint, you don’t want to leave holes,” Oathout says. Despite such preventive practices, structural repairs can sideline planes for long stretches. According to a Tinker news report, it took 18 months and “a very intensive engineering effort” to restore a B-52 deployed to Guam that had cracked a fitting where the wing connects to the fuselage. To replace parts that no longer are manufactured, Boeing relies on “a lot of reverse engineering” and finding suppliers that can make pieces based on original or slightly modified specifications, says Oathout. “You can create parts using the original recipes in many cases,” notes the Air Force Academy’s Shoales. Engineers use CATIA software and rapid prototyping to make 3-D models of the parts to facilitate manufacturing. The plan is to model every part, but it’s typically done on an as-needed basis. Occasionally, decommissioned B-52s are cannibalized for old parts that are in good shape and still usable. The B-52’s avionics also have been replaced over the years, though that’s a relatively easy task because planes are built to accommodate avionics upgrades, says Carlos Cesnik, a professor of aerospace engineering at the University of Michigan. For example, the B-52 was the first aircraft to fly low-level at night using forward-looking infrared and night-vision TV. The Air Force doesn’t always move swiftly in this area, however. Until a few years ago, the B-52 fleet still relied on early 1980s computers. Mission information had to be inserted while the planes were on the ground and couldn’t be updated once they took off. Now, along with the recent computer system upgrade, engineers are installing combat network communications technology (CONECT), which will include real-time, beyond line-of-sight digital communications and machine-to-machine data links for better targeting, and color display screens. Engineers still must race against advancing technologies, however. Boeing can upgrade 17 jets a year, so it will take nearly five years to handle all 76 bombers. By then, given the pace at which digital technology improves, some systems will be obsolete. Kroening’s team keeps in touch with suppliers to identify in advance which components are likely to become outdated or unavailable, and when. Maintenance crews have three solutions: Stockpile parts before manufacturers cease production, replace them with different parts of similar quality, or redesign the system. “We do a cost/trade-off study of all parts” and go with the least expensive option, says Kroening. The bomber’s changing missions have helped make the investment worthwhile while reducing its vulnerability to wear and tear. At high altitudes, flying is virtually stress free for planes. Low-altitude flights in turbulent air required engineers to strengthen and modify the B-52G’s airframe for Vietnam service, including removing the ailerons. (Pilots found it harder to fly, because lateral control was by spoilers only.) Today, the plane is again up in the stratosphere, firing standoff weapons – typically GPS-guided cruise missiles, which required major structural changes to the wings in the late 1970s – from hundreds of miles away. Arguably, the B-52’s biggest asset lies in its “overdesign.” That “goes way to the top of the list of things done right” by the original engineers, says Oathout, who notes there was no computer modeling when they designed the world’s first high-altitude bomber. “There were a lot of unknowns they just overdesigned for, and they just nailed it.” It also helps that the jets have logged only 18,248 hours in the air, on average. Though originally expected to fly 5,000 hours over its lifetime, the B-52 still falls far short of the 50,000 hours that commercial jetliners typically clock during their service. “In that sense, we’ve got a young chick,” Oathout says. With the big bird’s retirement decades away, more overhauls lie ahead. Over the next four years, for example, the B-52s will be reconfigured to house up to eight more missiles in their internal weapons bay (they already carry 12 missiles on the exterior weapons pylons). And Kroening says that modernizing its ’60s-era radar system would maintain performance if the GPS were knocked out, though that has yet to be budgeted. Still, given America’s ever changing national security demands, no wonder today’s Stratofortress crews enjoy pointing out that the last B-52 pilot has yet to be born. Can the next long-range bomber meet U.S. needs with current technology?